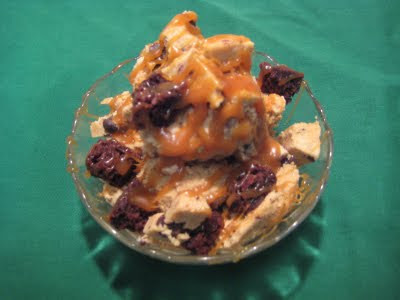 A few years ago, I was in the mood for a sort of Ben and Jerry's flavor of ice cream with lots of things mixed in. So I went to a Cold Stone Creamery and this was my fabulous Cold Stone "custom creation": coffee ice cream with brownies, chocolate chip cookie dough, and a caramel swirl. Doesn't that sound HEAVENLY? I asked a few friends what this flavor should be called, you know, just in case Ben and Jerry call me asking for ice cream ideas. Several ideas were suggested including "Mocha Choca Latte", "Cocoa Jitters", and my favorite one... "Cookie Dough Brownie Buzz". Combine eggs, yolks, and sugar in a bowl and blend thoroughly with a whisk or electric beater for about 5 minutes. Heat milk and cream in a medium saucepan; do not let boil, just “scorch” it until it is near-boiling hot. Very slowly pour the hot milk mixture into the egg mixture, beating rapidly with a whisk. Pour the egg/milk mixture back into the saucepan. Heat mixture over medium low heat, stirring constantly, for a few more minutes or until the consistency is thick enough to coat the back of a spoon. Strain mixture into a clean bowl and add coffee and vanilla extract. Place in fridge until completely cool. Pour into ice cream maker canister and freeze according to manufacturer's instructions. Place in freezer until firm. If you'd like to add the mix-ins as described above, stir them into the soft ice cream just before you place in the freezer.